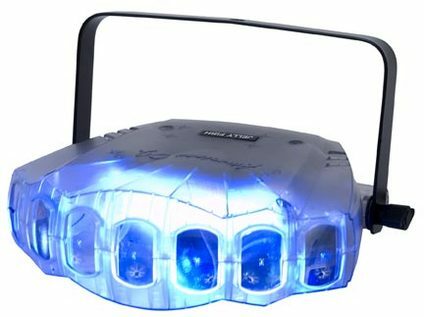 ​These lights work well for up lighting, dance floor lighting, stage lighting, table under lighting and even pin spot lighting. Programmable multicolor LEDs produce a dazzling array of colors that flash in time to the music, or change through different cycles. Bright LEDs generate almost no heat, and require very little power to stay bright. Perfect for creating an elegant or even club-like atmosphere in a small space. ​Sound activated LED DJ light that adds a lot of appeal and excitement to your dancing area. 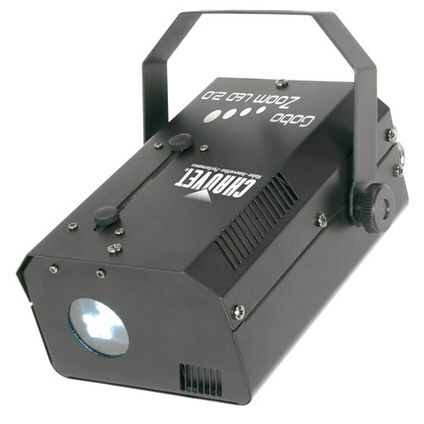 It creates heart-stopping light shows that pump energy onto your dancefloor. Can be set to flash in time to music, or cycle through user-set cycles, to complement the color scheme of your event. High-efficiency LEDs mean brighter light with less power, and negligible power consumption, so you can run more lights without risking a fuse blowout. 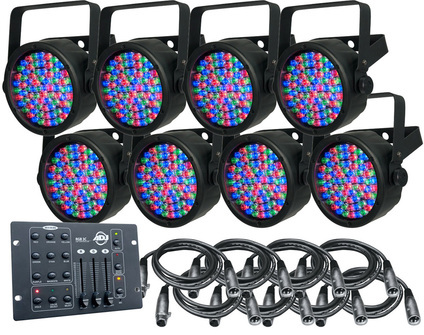 ​Another stellar addition to our dance floor lighting package. Projects red and green laser patterns all over floors, walls, and ceilings adding a futuristic touch to the music. The light is sound activated, and comes with several built-in programs, for complete customization of your dancefloor experience. Combine with a fog machine to really turn the party up. LED DJ light that produces a brilliant moving moonflower effect that looks very similar to a moving head fixture. High power LEDs keep this light bright without using too much power. Can be set to move in time to music, or to change colors and patterns on a user-set program. If you want your party to have the look of a Vegas nightclub, this is the light for you. Custom gobo projector. Allows you to project custom words, designs, and images anywhere in the room. If you want to personalize your wedding, then this is the perfect choice for you - project a beautiful display of your name and wedding date on the dancefloor, or above your table, for an elegant touch. 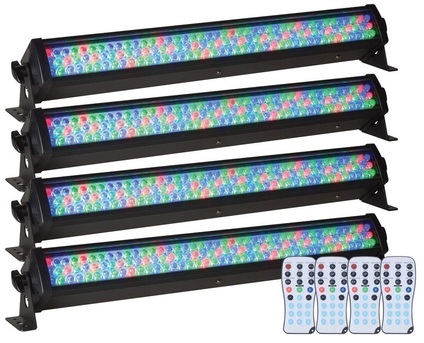 Multicolored LED wash light that creates gorgeous color wash effects on walls and ceilings. Great as a spotlight or dancefloor light. Provides good contrast of colors and very smooth color washes. Requires little power, and generates little heat, so you can string up plenty of these, to create a concert-stage ambience without blowing a fuse or melting your guests. Combination of different fixtures manufactured by different brands allows us to create unique design patterns for more beautiful light shows. Very bright and compact LED lighting bar. Often used for wall washing, dance floor lighting, stage lights and, most frequently, table under lighting. This light creates a very beautiful effect when it's placed under the head table, cake table or any other round table. Also great as stage backlighting to back and underlight performers to give your event a festival-like feel. We can set it to any color or have it slowly fade through different colors.